Spain is one of the world’s most welcoming destinations! And the deeper you dig into it, the warmer that welcome gets. Every layer you pull back reveals something smaller and infinitely more charming. In many ways it’s like an LGBT friendly nesting doll. Catalonia is tucked away inside and within that lie Sitges and Barcelona – just an hour apart, but offering two very different approaches to gay friendly holidays. 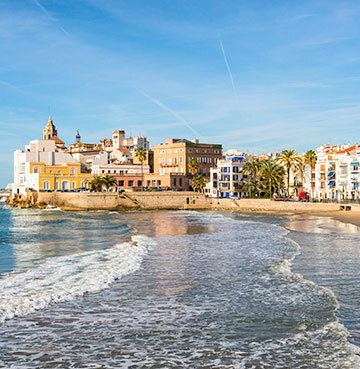 Sitges is bubbling with friendliness and coastal charm, while Barcelona is a snapshot of how a bustling, cosmopolitan city can make everyone feel like they belong. Our Costa Dorada villas place you in perfect reach of gay friendly Sitges and Barcelona. Forget gay friendly, Sitges gives a wide smile and warm welcome to all who visit! This is where locals feel like endearing old friends. A friendly grin here, a hearty laugh there – they’ve got the knack of making you feel at ease wherever you roam. So much so that you’ll struggle to notice the difference between gay friendly spots and everywhere else. Untouched by tourism, Sitges is seaside charm, laid-back beaches and classic Spain all rolled into one. And it’s this bundle of brilliance that has drawn visitors in droves, for many decades. If beach days are just the best, you’ll have 17 stretches of golden sand to choose from here. Picking your favourite is the only difficult decision you’ll have to make, as you kick back in the sun and feel soft sand beneath your feet. Platja de la Bassa is a sandy LGBT hub of fun, building a reputation as the go to gay beach in Sitges. Although in honesty, this seaside charmer has a full house of warm and welcoming sands. Grab a drink at a beachside bar and see for yourself, you’ll be nattering with a friendly face in no time. Quiet seaside resort by day, buzzing party scene by night – you might struggle to believe that it’s the same Sitges before your eyes. This is a town that really knows how to let its hair down! Outdoor bars bask in the evening glow, side streets conceal stylish cocktail bars, and lively clubs let you put those dancing shoes to good use. Start the party a little earlier with a pit stop in Parrot Pub, where beachgoers often stop for a tipple on their way home. The afternoon buzz here is the perfect end to your day on the sand. February feels like Mardi Gras, as the buzzing carnival takes over the streets of Sitges. Expect floats, drag queens and colourful costumes – bouncing to the beat of drums and swaying to Spanish sounds. These street party vibes return in June, as Sitges Pride once again fills the town with a festival of flamboyance. Thousands flock to watch the floats pass by, listen to international DJs and simply soak in the atmosphere! There’s something about the seaside that just makes for an amazing Pride event. Stop for a few drinks in Barcelona and you’ll soon understand that you’re in a thriving gay friendly destination. Themed bars, bear bars and outlandish drag queen hair bars – a crawl here is a unique thirst-quenching experience. 80’s nights and drag shows are brimming with entertainment, while roof top bars and slick cocktail-serving haunts offer laid-back sophistication. And then there’s those off the wall bars, one of a kind by an eccentric mile! Barcelona is home to a bar decorated like a French palace, a groovy hangout kitted out with religious ornaments and a bar offering German themed parties. Variety is certainly the spice of LGBT nightlife here! The Axel Hotel’s rooftop Sky Bar is a sunset spot for cocktails and cold drinks. 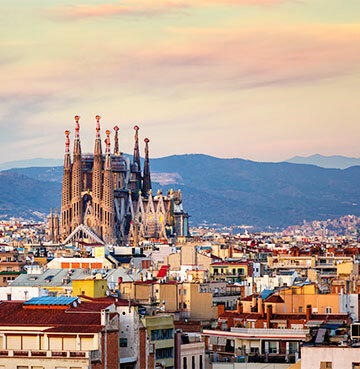 With views over Barcelona, there’s nowhere better to sip on a tipple and watch the sun disappear behind the skyline. It may not have the views, but Punto BCN certainly has the atmosphere! Getting livelier as the evening goes on, it’s one of the finest gay bars in Barcelona – mingle with tourists and locals or just enjoy the chance to test out your dancing shoes. Sometimes you just need a splash of colour, to let loose and have fun with those around you. If you found yourself nodding along as you read that, Pride Barcelona is the vibrant tonic you’ve been craving. It doesn’t get more colourful than Holi Pride, where powder paint floats along breeze – dancing to the beats of party songs. Expect to head home looking like rainbow sneezed all over you! Parades follow parties, in what feels like a week of non-stop fun – so prepare for performing artists and floats galore. Drag queen galas, high heel races and open-air foam parties make Pride Barcelona a truly unique celebration of the LGBT community. You might want to jet off for Pride fun in the winter sun, or go all in with a long haul holiday - why not check out some of our other gay friendly destinations? Orlando, Gran Canaria or somewhere else altogether?